All version require Steam DRM. Ranges from 60-90° (vertical). See Field of view (FOV). Set in launcher or use -screen-fullscreen 0 command line argument. Enabled by default; use -window-mode exclusive command line argument for exclusive fullscreen. AF is used but no setting is available. Full or half refresh rate Vsync available. Double buffer. 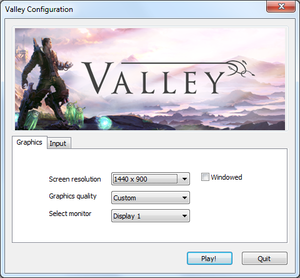 Disabling in-game Vsync caps the frame rate at 91 FPS. 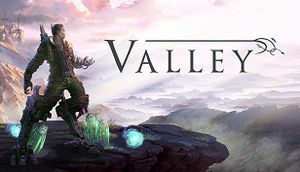 Open the Valley process from the File menu. 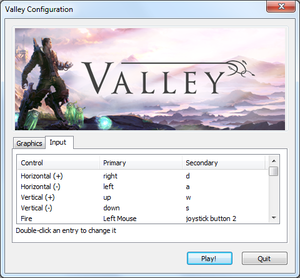 Activate the checkboxes beside Open, Scripts, FOV, and the one nested below FOV. Double-click on the value 75 under the Value column, and change the value as needed. Keys are fully remappable, but only through the launcher. Y axis has lower sensitivity than X axis, and cannot be adjusted separately. By default bindings are for Xbox controller. Rebinding mandatory for majority of controllers. Error creating thumbnail: convert: Expected 8192 bytes; found 8151 bytes `/tmp/localcopy_b222099d2dc9.png' @ warning/png.c/MagickPNGWarningHandler/1654. convert: Read Exception `/tmp/localcopy_b222099d2dc9.png' @ error/png.c/MagickPNGErrorHandler/1628. convert: no images defined `/tmp/transform_fbe6364963ae.png' @ error/convert.c/ConvertImageCommand/3258. Error creating thumbnail: convert: Expected 8192 bytes; found 8151 bytes `/tmp/localcopy_f55c8574dc99.png' @ warning/png.c/MagickPNGWarningHandler/1654. convert: Read Exception `/tmp/localcopy_f55c8574dc99.png' @ error/png.c/MagickPNGErrorHandler/1628. convert: no images defined `/tmp/transform_531e3edcaeff.png' @ error/convert.c/ConvertImageCommand/3258. The developer console can be accessed in-game by pressing ~ (ö on QWERTZ keyboards). The command togglegui will disable the HUD. Type help or use ↓ for a list of additional commands. Note: The command toggledebug will disable saves and Steam achievements until the game is restarted.